I was surprised to see that I had never used the flower theme for the CBBH Photo Challenge before, because I take so many photos of plants, trees and flowers. So, I thought I would remedy that situation by sharing with you some of the flowers that grow here in my garden in southern Spain, at different times of the year. The first photo (above) is a waxy-flowered stephanotis, which creeps along my fence and gives off a delicate fragrance. I sometimes find it difficult to photograph the purple agapanthus, as they flower at the end of long stems, so I got in close for these shots. I like the effect of the first photo, in particular, but what do you think? 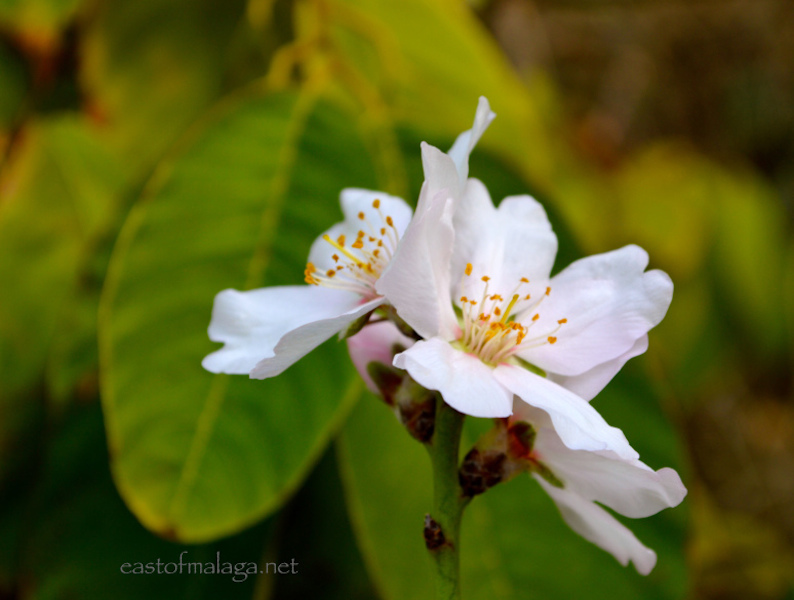 Here is a photo of the first delicate blossom on one of our 47 almond trees, in January this year. 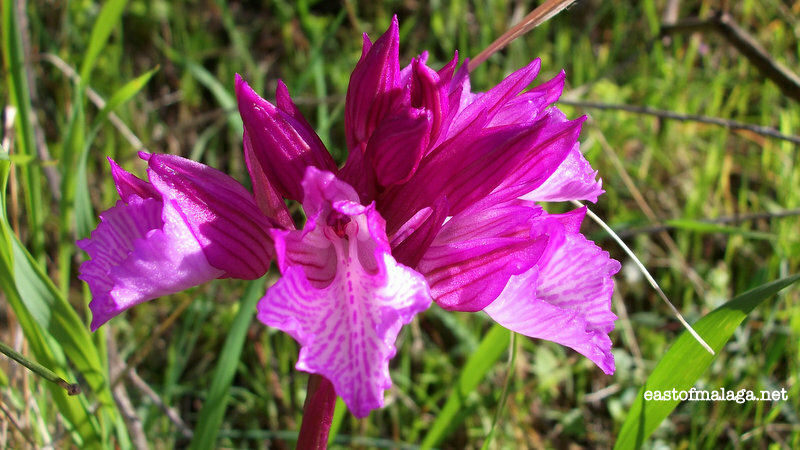 ….and these beautiful wild Butterfly Orchids also make their appearance each year, heralding the arrival of Springtime in Andalucía. I’m a huge fan of the colour purple, so this plant is a favourite of mine, and it was only thanks to some of my readers that I finally found out its name. Hardenbergia comptoniana, a native of Australia, is a vigorous climbing plant and the arching flowers look so beautiful after the rain. So, I’ve shown you mine – now it’s YOUR turn to show me YOURS! *** Travel writer Annie Bennett spends most of her time Mooching around Spain, researching articles for national newspapers and magazines, but often just sitting in cafés, reading the paper and drinking wine. Not only does Annie love writing about her travels, she also loves writing about food. So, if you want to know where in Lanzarote you can buy the best cheese, or exactly where you can find a traditional shop in Menorca that sells everything horse-related, then Annie is your woman! 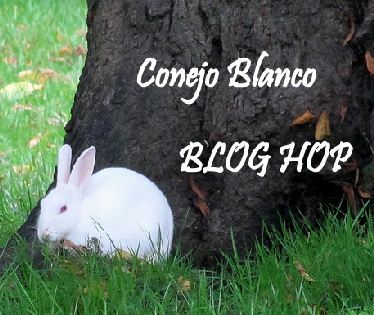 *** Another blogger I always enjoy visiting is Tamara at A Foot in Two Campos who, two years ago, bought a beautiful old house in the village of Colmenar, in Málaga province. She had me worried for a while when she admitted in one of her blog posts to stalking me – but fortunately, what she meant was that she was inspired to visit three places that I had blogged about! Tamara has thrown herself into village life in Colmenar and also into learning Spanish. Indeed, at the end of each of her blog posts she discusses a particular language point, which always proves helpful. Please HOP over and say HELLO to both of these ladies, and tell them Marianne sent you! So that´s the CBBH Photo Challenge for July, everyone. This entry was tagged Andalucía, CBBH, CBBH Photo Challenge, East of Malaga, Europe, flowers, garden, gardening, gardens, Malaga, photography, Spain. Bookmark the permalink. What wonderful photos Marianne…I have never seen an almond blossom before so thank you for that. What a lovely variety of blooms you have. Am pleased you included an almond bloom which is new to me. And what do you do with your almond harvest? I guess they are not too dissimilar to apple blossom, Lynne. Very pretty, anyway. As for the harvest, well we don’t do much with it, to be honest. Our land is on a steep hillside (for the most part), so mechanical means of shaking the almonds from the trees are impossible. Even whacking the trees with big sticks could prove dangerous if you lost your balance and fell down the bank! We tend to knock some of them off for personal use – but that’s it. Of course, there’s then the not too small matter of cracking the hard shell open to get to the nut inside! Beautiful flowers, Marianne. The Agapanthus are a stunning colour. They are indeed 🙂 Thanks Sylvia. The shots are beautiful Marianne but the almond blossom is just stunning. I’m very fond of rock roses and dog roses which often come out in those colours. The agapanthus are beautiful right now. I have quite a few in my garden. 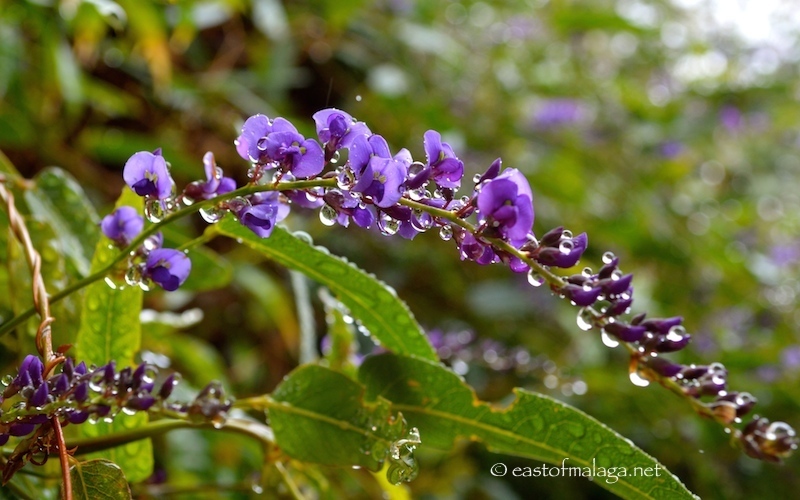 Love your photos, especially the hardenbergia with the raindrops – my kind of picture! Are we limited to one shot? Yes, the butterfly orchids are growing wild – not in the lawn (we don’t have one of those here – the land is too rugged) – but in a couple of the banks. Still in one of the wilder parts of the land, rather than manicured. I love them, too! I prefer the bluey purple ones to the white – how about you? I remembered! Both to say white rabbit and to look for you this morning, Marianne 🙂 Incredible that you haven’t featured flowers before! 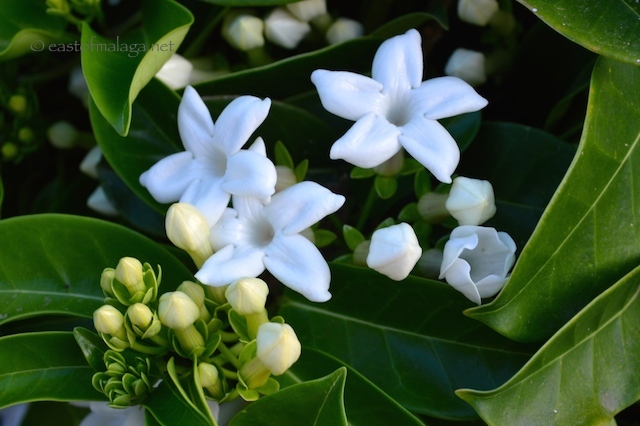 The Stephanotis is an exquisite shot but my favourite is the last one. Tamara sounds my kind of girl. I’d better go visiting. Happy July to you! Hope the fires are now well contained? Thankfully the fires are now extinguished. That was scary! I love it too, Gilly – can’t believe I haven’t had a flowery theme before!